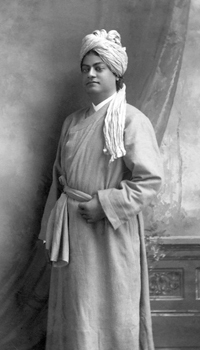 In connection with Swami Vivekananda’s 150th Birth Anniversary a 10 foot 7 1/2 inch statue of Swami Vivekananda is going to be unveiled at the Tapovan, our retreat center in Arlington on Sunday, October 7th, at 11 AM. The guest of honor is Swami Paritustananda from the New York Vedanta Society. The event will consist of the unveiling ceremony, musical presentations, release of the Spanish translation of Swami Bhaskarananda’s book Meditation, Mind and Patanjali’s Yoga, and a vegetarian potluck lunch. Among the musicians will be Sisirkana DharChoudhury, the renowned violinist of India. Swami Atmavidyananda from our Hollywood Vedanta Society will present Vedanta in Song: Spiritual Teachings of Ramakrishna and Vivekananda. Please contact Devra Freedman at or call her at 206-323-1228 by September 30th to let her know your contribution for the vegetarian potluck lunch. Food suggestions: Kichuri, labra, chutney, and payesh/mishti doi. We also need volunteers to help serve the food, etc. Please contact Devra Freedman at or call her at 206-323-1228 if you are able to help with the function. ALL ARE MOST CORDIALLY INVITED TO ATTEND.